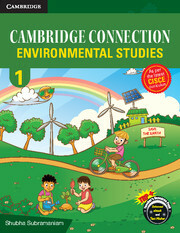 Cambridge Connection: Environmental Studies for ICSE Schools is a series of books for classes 1 to 2, designed as per the latest curriculum released by the Council for the Indian School Certificate Examinations (CISCE). The series develops awareness of the natural, social and cultural environment and issues/concepts in a holistic manner through various activities, skills and values. The series aims to give a basic idea of what the subject encompasses, along with keeping pace with the changes taking place in the environment around the learner. Warm up at the start of every chapter leads the learner to the main topic. Did You Know? in each chapter gives information and interesting snippets beyond the text. Little Scientist cites engaging scientific facts related to the topics under discussion. Get Busy gives brainstorming activities. Exercise has variety of questions to reinforce the concepts covered in the chapters. Life Skills have tasks integrating the concepts with relevant life skills. Connect has activities based on cross-curricular integration of concepts with other subjects. Project has hands-on project ideas. Environment Corner is a learner-friendly section to focus on sustainable environmental practices.